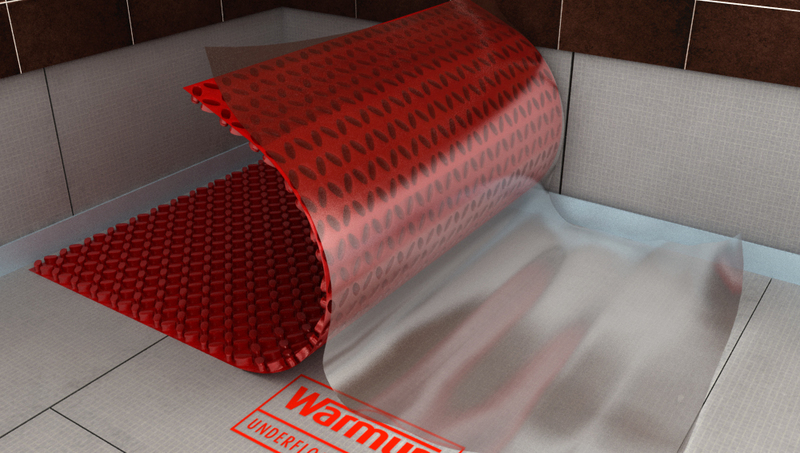 It is with great excitement that Warmup® announces that the much-awaited DCM-PRO Peel-and-Stick version of the DCM-PRO Membrane floor heating system is coming to North America. The TCNA-tested membrane is the first of its kind and adheres directly onto plywood and concrete subfloors without the use of thinset. Launched in the UK, France and Germany in 2016, it has been successfully tested to ANSI 118.12 anti-fracture standards and the Robinson test (ASTM C-627). Combined with the DCM-PRO cable, it is the only UL-approved membrane system on the market today. The patented DCM-PRO Peel-and-Stick System is making top-of-the-line floor heating accessible to all installers. The Warmup® DCM-PRO design has gained popularity in its first year with a fleece-backed version, delivering warmer floors, faster. The DCM-PRO design allows higher heating outputs and for more adhesive-to-cable contact. This allows heat to distribute faster and more evenly through the floor. In addition, the design also offers protection from installation damage, reducing the risk of cable failure. The popular benefits of our fleece-backed Membrane led to the innovation of the DCM-PRO Peel-and-Stick Membrane. The polyethylene adhesive will bond to subfloors with 140 lbs of torque/sqft leading to 40% savings in time and materials. Simply cut the membrane to size, peel back the protective film, press the membrane directly onto the subfloor, and fit the cable in! The use of modified or unmodified adhesives over the membrane is the installers’ choice to best suit their installation needs. The DCM-PRO Peel-and-Stick Membrane can also be covered with self-leveling mortars (SLU’s) to allow installation of small format tiles and other floor types such as glue-down wood and LVT’s. There is no waiting required after installation so you can begin laying flooring immediately. The DCM-PRO Membrane is ready to tile. Warmup’s DCM-PRO System can be found in retail locations across North America. To learn more about the DCM-PRO Peel-and-Stick Membrane visit our website and come to see it first at TISE / Surfaces in Las Vegas, January 21-25, 2019. Warmup is a certified ISO 9001:2008 manufacturer creating and delivering electric heating solutions. It has sold in excess of 2 million systems in more than 60 countries in 25 years of trading. Warmup has subsidiary operations in 11 countries and licensed trading partners in other countries. The Warmup EN422-2 Research Center in Bremen, Germany and its Monitored Homes Program drive the innovation behind the DCM-PRO family of products and the 4iE Smart WiFi Thermostats.